Custom designed specific-use slack adjuster pullers to fit all major brands from Manual to Automatic Self-Adjusting type slack adjusters. During the process of removing the clevis pins, the cotter pins are sheared off. This kit provides two brake clevis pin presses for quick removal of the clevis pins. Note: Threads must be clean and well lubricated at all times. Do not use over 1⁄2" impact wrench—doing so will void warranty. Remove clevis from the end of the slack adjuster with the Tiger Tool 10501 Brake Clevis Pin Press. With the forcing screw backed fully out, slip the puller onto the slack adjuster. Turn the forcing screw by hand or with an impact wrench. Slack adjuster will drop off when free. Remove clevis from the end of the slack adjuster with the Tiger 10501 Brake Clevis Pin Press. Attach tool to slack adjuster through clevis hole and tighten. 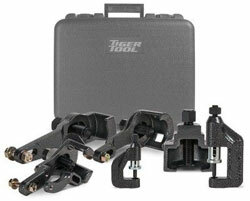 Remove clevis pin and clevis from the end of the slack adjuster with the Tiger Tool 10501 Brake Clevis Pin Press. Select proper arm and attach to puller main body with 1⁄2" x 1" bolt supplied. Do not tighten at this time. Note the straight arm is for older style Haldex slacks as shown at right, while the bent arm is for newer angled and/or offset Haldex Slack Adjusters. With forcing screw fully backed out, slip the puller onto the slack adjuster. Insert 1⁄2" x 2 1⁄2" bolt through clevis pin hole and puller arm slot. Secure with washer and nut by hand. Tighten 1⁄2" x 1" and 1⁄2" x 2 1⁄2" to securely mount puller to slack adjuster. Turn the forcing screw with hand or 1⁄2" impact wrench. Back forcing screw fully out. Pull back spring-loaded plunger and slip tool over clevis pin. Once the pin is free of clevis, back out forcing screw and remove tool. Note: Threads must remain clean and well lubricated at all times. Do not use over 3⁄8" air ratchet—doing so will void warranty. Back out the forcing screw. Pull back the spring-loaded plunger and slip the tool over the slack adjuster rod pin. Turn forcing screw by hand or with a 3⁄8" air ratchet; the tool will shear the cotter pin. Once the pin is free of the rod/clevis, back out the forcing screw and remove tool.